First, let’s satisfy your insatiable curiosity. Johann Schelle (1648–1701) was Bach’s predecessor once removed at Leipzig. Schelle served the Thomaskirche as Kantor from 1677 until his death in 1701. He also had the distinction of having sung under Heinrich Schütz in Dresden. The Harvard Biographical Dictionary credits him with introducing the Gospel cantata and the chorale cantata to Leipzig, but little of his music is extant. He was succeeded by Johann Kuhnau (1660–1722), who is best known unfortunately and unfairly for dying, thus leaving the vacancy ultimately filled by Bach in 1723. According to HBD, Kuhnau encountered difficulties in his later years in Leipzig, but his compositions were well regarded in his day. Schelle is represented on this disc by a brief (4:14) funeral motet. 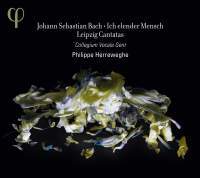 Although Philippe Herreweghe’s recordings of Bach’s major choral works and his forays into the cantata repertory are universally admired, he hasn’t committed himself to record a comprehensive edition of the cantatas. He has preferred to approach the repertory at a slower pace, recording individual discs built around themes. The present disc is one, but its theme, Leipzig Cantatas, seems a little broad. It’s not. In assembling the program Herreweghe has indentified three basic compositional patterns in the cantatas and chosen one of each from the first Leipzig cycle and appended another that does not follow any of the three structural models. It’s all very interesting, but if it strikes you as being a bit too analytical for comfort, let me assure you that it will have no affect on your enjoyment of these superb performances. With his mounting discography, is Herreweghe apt to become a stealth completist? Would that he were, but it may take a while. He’s a little than a quarter of the way through the list, and he’s on his third label (Harmonia Mundi, Virgin and, now, Phi). But don’t forget that his Collegium Vocale provided the choral contingent for most of Gustav Leonhardt’s share of the Teldec series. He knows his way around the cantatas, and it shows.